The “Bhaijaan” of Bollywood and the king of the box office, Salman Khan is the unbeatable handsome hunk whose name is probably enough to elucidate his identity. Born as Abdul Rashid Salim Salman Khan, Salman Khan is the son of the famous Bollywood screenplay writer, Salim Khan and Sushila Charak (Salma Khan). He was born in Indore, Madhya Pradesh on 27th December, 1965. He is the eldest of his two brothers, Arbaaz Khan, who got divorced with Malaika Arora Khan, and Sohail Khan, who is married to Seema Sachdev and has two sons: Nirvan and Yohan. Salman has two sisters, Alvira Khan Agnihotri, who is the wife of actor/director Atul Agnihotri and an adopted sister Arpita Khan, who is married to Aayush Sharma and has a son, Ahil. Salman loves painting, writing and swimming. In fact, he once wanted to become a writer himself, like his father. He is considered to be one of the most successful commercial actors worldwide and has a stupendous fan following in Asia as well as the Indian diaspora around the world. He is known for his tight fitness regime and believes that his work itself is a holiday, so he’s never stressed out. He has been a very sensitive person in the relationships, especially when he was dating Aishwarya Rai back in 1999 and Katrina Kaif in 2009; both of them failed miserably. Less people know that the superstar is suffering from Trigeminal Neuralgia, a facial nerve disorder which is also known as the "suicide disease". Salman did his schooling from St. Stanislaus High School, Bandra (Mumbai) and attended college from St. Xavier’s College, but he dropped out from there. He had a flair of acting and so, he started his journey in Bollywood as a supporting actor in the movie ‘Biwi Ho To Aisi’ (1988). During the following year, he did ‘Maine Pyar Kiya’ (1989) which was a blockbuster hit and gave a new meaning to ‘love means friendship’. Instantly, Salman became the instant lover boy of Bollywood and the screen name ‘Prem’ became a hit. ‘Maine Pyar Kiya’ was dubbed in numerous Indian and international languages, and people simply loved it. From the year 1990-1993, Salman Khan delivered average performances in the films like ‘Baaghi: A Rebel for Love’, ‘Patthar Ke Phool’, ‘Sanam Bewafa’, ‘Kurbaan’ and many more, but his film ‘Saajan’ (1991) was a box office hit. His career took a drastic turn when he did a Sooraj Barjatya’s film, ‘Hum Aapke Hain Koun’ (1994), the film was a super-duper hit and it became the "Biggest Blockbusters Ever in Hindi Cinema". His chemistry with Madhuri Dixit was very much loved by all and they both bagged a Filmfare Best Actor and Actress award for this movie. ‘Karan Arjun’ (1995) was Salman’s yet another megahit movie and his role as ‘Karan’ was highly appreciated. In 1996, he did Sanjay Leela Bhansali’s ‘Khamoshi: The Musical’ which was critically acclaimed and ‘Jeet’ which was average. 1997 again saw two movies of Salman Khan i.e., Judwaa and Auzaar. The former was a commercial hit and the latter did average. His growth as a sensitive, aggressive, funny and overall a versatile actor could easily be seen in his subsequent movies likes ‘Pyaar Kiya To Darna Kya’, ‘Jab Pyaar Kisise Hota Hai’, ‘Hum Saath-Saath Hain: We Stand United’, ‘Biwi No.1’ and ‘Hum Dil De Chuke Sanam’. He came as a supporting actor in the blockbuster hit ‘Kuch Kuch Hota Hai’ for which he also won the Filmfare award for Best Supporting Actor. The year 2000 brought him some serious roles in ‘Har Dil Jo Pyar Karega’, ‘Chori Chori Chupke Chupke’ and ‘Hum Tumhare Hain Sanam’ (2002) which had a lot of substance in the story and his roles were very appreciated. The year 2003 gave him a very challenging film ‘Tere Naam’ which was one of the best critically acclaimed movie in his lifetime. 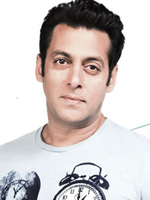 With the center-parting hairstyle and vulnerable character, Salman proved to everyone that he can enter into the skin of any character. In the later years, he again went to make box office hit movies like ‘Mujhse Shaadi Karogi’ (2004), ‘No Entry’ (2005) and ‘Salaam-e-Ishq: A Tribute To Love’ (2007). In 2007, he did a Hollywood movie ‘Marigold: An Adventure in India’ which portrayed the love story of an Indian guy and an American woman; it performed average in the industry. With back to back failures, Salman Khan again emerged as a box office hitman in the movies like ‘Wanted’ (2009) and ‘Dabangg’ (2010), which smashed many records commercially. Salman introduced Sonakshi Sinha in Dabangg. His comic roles coupled with some die hard fights pleased his fans like anything and the movies crossed 100 crores. Since then, Eid has become a lucky day for Salman’s movies and he created blockbusters during this festival. For Dabangg, Salman got awarded at the Star Screen Award for Best Actor and the Stardust Award for Star of the Year – Male. In 2011, ‘Ready’ and ‘Bodyguard’ again had a massive opening and Bodyguard became the year’s highest earning movie. Salman’s 2012 big release was ‘Ek Tha Tiger’ opposite Katrina Kaif which had mixed reviews, but had an amazing box office grossing. Also, ‘Dabangg 2’ was released in 2012 which made excellent box office collections and the fans went crazier for Sallu Bhai. He took a year gap and re-entered in the films with a bang by giving a powerful performance in ‘Jai Ho’ (2014) and ‘Kick’ (2014). Everyone loved the story and Salman’s effortless performance. The movie ‘Bajrangi Bhaijaan’ (2015) came as a delight for all the movie lovers and it entered into the 200 Crore Club, making the film both commercially and critically acclaimed. And the latest release of 2016 was ‘Sultan’ which broke several records in the box office and it was soon spotted in the 300 Crore Club. In the year 2011, Salman launched his self production house by the name of ‘SKBH Productions’ (Salman Khan Being Human Productions) where the money earned will be donated to his own NGO, ‘Being Human’. This foundation supports many NGOs financially and by skill development. Salman has also launched his own mobile application, 'Being In Touch' where his fans will be updated about Salman and his complete insights. On his 51st birthday, Salman introduced ‘Being Human Jewellery’ by collaborating with Style Quotient Jewellery Pvt Ltd. Also, in 2014, Salman launched yet another production house, ‘SKF’ (Salman Khan Film). ‘Dr. Cabbie’, a Canadian film was launched under SKF and Sooraj Pancholi’s debut film, ‘Hero’ was also made under the banner of SKF which also had Athiya Shetty as a debutante. ‘Bajrangi Bhaijaan’ had also been under SKF. Apart from Bollywood, Salman has also appeared in the Television with very popular shows like ‘10 Ka Dum’ and is currently hosting ‘Bigg Boss Season 10’. He also appeared in a few instances in the TV shows like Kaun Banega Crorepati, Rahul Dulhaniya Le Jayega, MasterChef India and DID –L’il Masters. His lifelike wax statue was established in 2008 at the Madame Tussauds Museum, London and another wax image was installed in 2012 at the Madame Tussauds Museum, New York. People Magazine, India declared him the Sexiest Man Alive in 2010; and ranked him as the second "Most Googled Indian of 2015". Currently, he tops the chart of 2016 Forbes India Celebrity 100 List. Salman Khan is one of the most loved Bollywood celeb that India has ever witnessed despite of the fact that he has been under many controversies. His disorderly relationship with the actress Aishwarya Rai, his hunting of Chinkara deer, and a hit-and-run case for which he spent 5 years in jail, have made him suffer like anything. He still is the coolest guy who has a lot of faith in God and work. We will definitely see more of Salman Bhai in the near future and will still love him from the core of our heart.